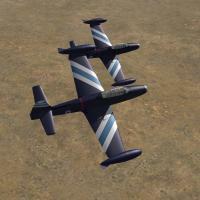 Hi.. again this is a skin for the Greek F-84G plane with ...aerobatic team color's, Aces Four. In the link above they are more information's about ..if you want. Thank's the combatace...and all of you .. 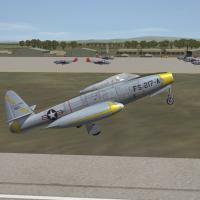 Here are several new skins for the stock 3rd Wire F-84F Thunderstreak (this is the swept wing one, not the slab-winged C/D/E/G). These represent USAF and Air National Guard units in the 1950s through the A/Cs retirment in 1971 (ish). This packge ONLY contains skins and decals. I've not supplied any parts for you to make it Player Flyable . There are other mods that do that. Most markings are decals, excepting the 55ths color bands. Decal randomization is TRUE. For the 55th, those numbers displaying a star (*) on the loadout screen (individual aircraft dropdown) are 100% historically correct for the unit. Those withOUT the star, while having served with the 20th FBW, could not be traced to a specific squadron. The other two units use "generic" sets, either created by me, or in the case of the 119th, using stock 3W number decals. The SF2 "date switch" is used for the 182nd, activating it automatically in 1969. By that time, all remaining American units HAD been swtiched to SEA camo. As always, fairly easy to follow, yet detailed install instructions are included. So, please read them! And have fun! The Republic F-84F/Q Thunderjet Single-seat fighter-bomber in TuAF service. 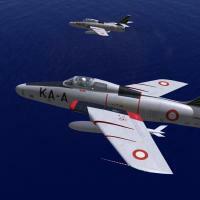 F-84Q were old F-84F overhauled aircraft supplied in '60 to Turkey. N. 108 (F) and 185 (Q) planes delivered in 'to TuAF and served from 1958 to 1957. 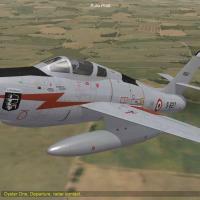 - F-84F.ini to fly this superb model, with backup to restore after patching. all in your main mod folder. 2 camo and 1 silver skins with 89 historical decals. Bonus F-8F_data.ini with openable canopy (Key=0) and tail light put in place. The Republic F-84F Thunderstreak was an American-built swept-wing turbojet fighter-bomber. While an evolutionary development of the straight-wing F-84 Thunderjet, the F-84F was a new design. N. 24 planes were delivered to KLU and served from 1955 to 1963. (*) Pics made using new Stary's Sarcasm 2.0 Beta !!! Il Republic F-84F Thunderstreak è stato un turbogetto statunitense con ala a frecccia e compiti di caccia-bombardiere. 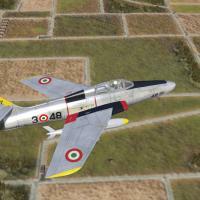 Nonostante fosse un'evoluzione del F-84 Thunderjet con ala dritta, l'F-84F fu un nuovo progetto. L'A.M.I. ricevette 194 macchine e le usò operativamente dal 1955 al 1972. - Apertura tettuccio animazione 10. - open canopy 10 key. Il Republic F-84F Thunderstreak è stato un turbogetto statunitense con ala a frecccia e compiti di caccia-bombardiere. 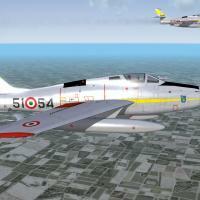 Nonostante fosse un'evoluzione del F-84 Thunderjet con ala dritta, l'F-84F fu un nuovo progetto. Il RF-84F Thunderflash era una versione da ricognizione fotografica. L'A.M.I. ricevette 78 macchine e le usò operativamente dal 1955 al 1973. The Republic F-84F Thunderstreak was an American-built swept-wing turbojet fighter-bomber. While an evolutionary development of the straight-wing F-84 Thunderjet, the F-84F was a new design.The RF-84F Thunderflash was a photo reconnaissance version N. 78 planes delivered to A.M.I. and served from 1955 to 1973. - open canopy 10 key, automatic closing at take off, paking open. 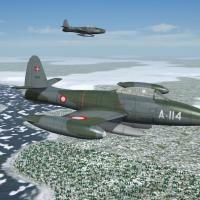 This is a Belgian F-84F true camouflage, with the correct tail markings! Mine was just an idea, all credit goes Paulopanz. These are three skins representing the 154th gruppo and 155th gruppo of the 6th Aerobrigata and the 101th gruppo of the 5th Aerobrigata. All three squadrons received the F-84F, replacing their F-84G's. The decals contains authentic serials most of which match the squadrons. It's not 100% historically accurate, but they look good over the Libya map. 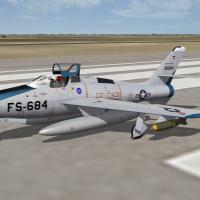 Unzip and paste the F-84F folder (Objects/Aircraft/F-84F) in the corresponding folder in your mod folder. The Decals go into the corresponding Decals folder. Ludo for the layered template that I used to make these skins. A simple reskin/redecaling for the recently released F-84G Upgrade Pak. 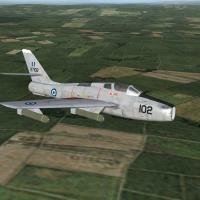 This skin represent Euro-style camoflaged Thunderjets of the Royal Danish Air Force. They were painted such (as what little data seems available) during the later years of their service. 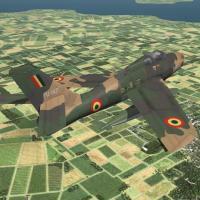 The skin itself is a repainted/relined version of the 1stGen JRV (Yugoslavian AF) skin by Homer. I just retouched some bits to remove other bits! Full credit goes to him for the skin (wherever he may be). 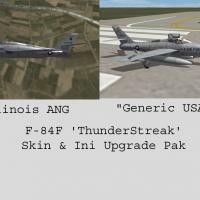 This ini and skin pak will update your stock F-84F Thunderstreak to a player-flyable aircraft (if you havn't done so already), and adds a new skin representing the 170th TFS, 183rd TFW, Illinois ANG, circa 1961 when the unit was Federalized during the Berlin Crisis. New, updated inis have been included; main, data, loadout and avionics, along with a loadout tga and NEW hangar screen. A radar-ranging gunsight has been added (APG-30), and all the lights have been corrected and expanded, adding the landing/taxi light and formation/ID lights on the vertical stab. The canopy has been activated via a manual animation control keystroke; use shift/0 to open and close. Other upgrades included "splitting" the inboard stations into 2 groups, allowing for the historic use the Mk.7 nuclear weapon on the left side, and the drop tank on the right. This loadout is NOT set in the loadout ini (standard bombs are), but is available for player selection from the loadout screen when in game. The Mk.7 weapons ARE included, courtesy of one lindr2's weapons paks. They've been converted for SF2 usage. Nuke effects are NOT included. The cockpit is from Zur's F-86s, with my K-14 gunsight. As always, =READ= the enclosed readme for full, detailed instructions. This package has been broken down into the various folders that SF2 needs, to make it a LOT easier to install. Of course, there's the usual 'Notes" section for explanations, ramblings, and other odd things. All new, 100% historically correct serial and BuzzNumber decals have been created for all skins.Those skins have stars (*) in their number lists next to the ID number, denoting those with 100% positive identification. Those without stars (*) served in the KTO, but I was unable to run down exactly which wing/squadron. There are only 18 serial/buzz numbers for each aircraft. All decals are Randomized. Also included is a small update for the 7/8/9th FBS skins; the addition of the squadron patch for the 'paint chip' seen on the Loadout Screen. As always, fairly easy to follow, fairly detailed install instructions are included. So, please read them. A simple addition for the recently released F-84G Upgrade Pak. 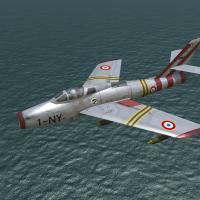 This skin represent all aircraft as used by the IIAF during the 1950s and 60s, until they were replaced by F-5As sometime around 1965ish. All new historical serial numbers for the 75 aircraft were created, depicting the 3 squadrons of the Wing that operated them from Mehrabad (like, how hard is it to do 3-01 thru 3-75???). As always, fairly easy to follow, detailed install instructions are included. So, please read them!! The expected "Notes" section as well, for those interested. 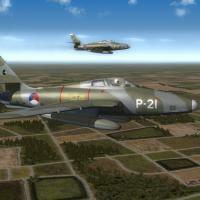 Thank's the.... first Modder's that start this skin's.....for the other Air force's.... and the maker's of the plane ....! I hope you will like it...! p.s. Don't forget to vote the modder's/maker's..... they making...a free work.....! That's why we have all this plane's and skin's...here free ...to play the game....! for the HAF. Also they are 2 silver skin's ! It is not for the stock version Attention ! I hope you will like it. If you like it don't forget to vote all the skin's on the combatace.com. Don't forget all the Modder's are make in hard work...and...FREE ! So don't forget to vote them !! THEY ARE COMING ALSO...NEXT THIS THE SEA...! P.S. DON'T FORGET TO VOTE...IF YOU LIKE IT. Here you have 12 siver skins, made using Shusjake's temps, generic and for each squadron. Historical serials & loadoutimage tga. All credits to DERK who helped me in this job (houdoe!). Here you have 2 camo + 3 siver skins, made using Shusjake's temps. Historical decals & loadoutimage tga. Here come "Belgae Gallorum fortissimi" Thunderjets! 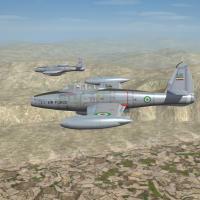 2 F-84E + 1 F-84G skins for general use. 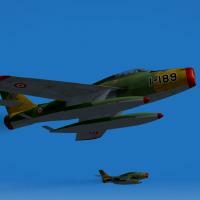 [i hope that someone will make the F-84F serie, too]. This is for Kevin and Eric (NATO 5).